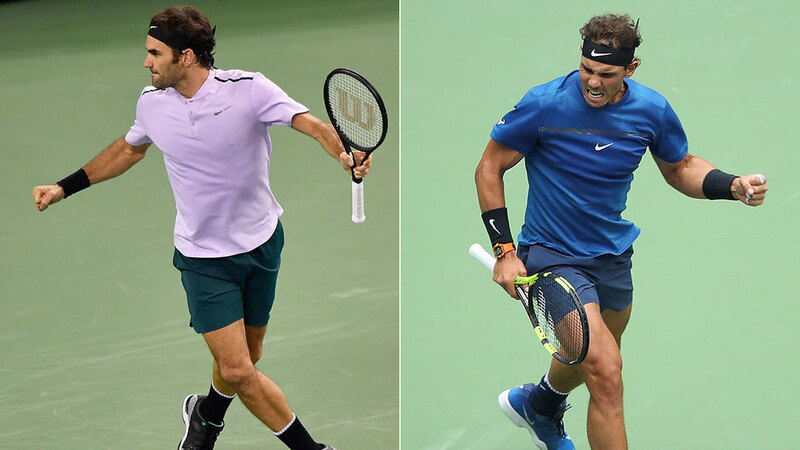 After battling through an absolutely packed draw this week, Rafael Nadal and Roger Federer are the last two men standing at the Shanghai Rolex Masters, and they’ll battle it out for the title on Sunday. 2. This is the first time they’ve played four times in a year since 2013. That year, Nadal went 4-0 against Federer with wins at Indian Wells, Rome, Cincinnati and the ATP World Tour Finals. It’s the sixth year they’ve played each other four or more times (after 2006, 2007, 2008, 2011 and 2013). 3. Both players are phenomenal in finals. Federer is 26-19 in his career in Masters 1000 finals (and 93-49 overall) while Nadal is 30-15 in his career in Masters 1000 finals (and 75-35 overall). Also, Nadal’s trying to win his 31st Masters 1000 title, which would pass Djokovic for most all-time. 4. Nadal’s going for his first Shanghai title, Federer just his second. This tournament has been dominated by Djokovic and Murray, who’ve won six of the last seven titles here. Nadal’s best result before this year was a runner-up finish to Davydenko in 2009, and Federer won the title here in 2014. 5. Federer’s trying to tie the record for second-most ATP World Tour titles in the Open Era. With 93, he’s currently in third place for most ATP World Tour titles in the Open Era behind Connors (109) and Lendl (94). Fourth place is McEnroe (77) and fifth place is none other than Nadal (75). 6. Nadal’s on a 16-match winning streak. Since falling to Kyrgios in the quarterfinals of Cincinnati, Nadal has gone 16-0 (7-0 to win the US Open, 5-0 to win Beijing last week, and 4-0 so far here). If Nadal wins, it’ll also be his tour-leading seventh ATP World Tour title of the year - he already leads the tour with six. Federer and Zverev are right behind with five (so Federer will tie Nadal with a win). 7. Federer has nine career wins over World No.1s. BUT He’s only beaten Nadal twice when the Spaniard was No.1, in the final of Madrid in 2009 and the final of the ATP World Tour Finals in 2010. Five of his other seven wins over No.1s have been over Djokovic (plus one Hewitt and one Roddick). 8. Speaking of No.1, Nadal can all but clinch year-end No.1 with this title. If Nadal wins, he’ll extend his lead in the year-to-date race to 2760 points, making it almost impossible for Federer to catch up. But if Federer wins, he’ll close the gap to 1960 points, which will be tough but attainable.